Four years ago, AMS student Kirsty Callaghan, then on her Year Abroad, wrote us a firsthand account of the Obama campaign in Kissimee, Florida for the 2008 election. Now, Kirsty is back in the US, teaching and studying at the University of Wyoming. 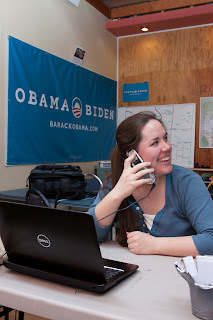 On her own blog, Forever West, she's written a new account of her experiences volunteering for the Obama campaign in Colorado. It's available here - check it out, and marvel at how time flies. The Arthur Miller Centre Prize of £500 is awarded annually for the best journal length article on any American Studies topic in the preceding calendar year by a United Kingdom citizen based at home or abroad or by a non-UK citizen who publishes their essay in a United Kingdom journal, providing that the entrant is a member of the British Association of American Studies in the year of submission. The Arthur Miller Centre First Book Prize of £500 is awarded annually for the best first book on any American Studies topic in the preceding calendar year by a United Kingdom citizen based at home or abroad or by a non-UK citizen who publishes a book, providing that the entrant is a member of the British Association of American Studies in the year of submission. Please Note: Books submitted for consideration for the BAAS book prize are ineligible for consideration for the Arthur Miller Centre First Book Prize.